Parkinson has become the second more common neurological disease in United States. Parkinson’s disease (PD) is a brain disorder that affects about 1.5 million individuals in the United States, with over 60,000 new people diagnosed each year. It affects both sexes in equal numbers, and while PD usually occurs after the age of 65, 14% of those diagnosed are under the age of 50. According to the experts Neurons in a part of the brain called the substantia nigra produce a neurotransmitter called dopamine to control movement. With Parkinson’s, these neurons die off. 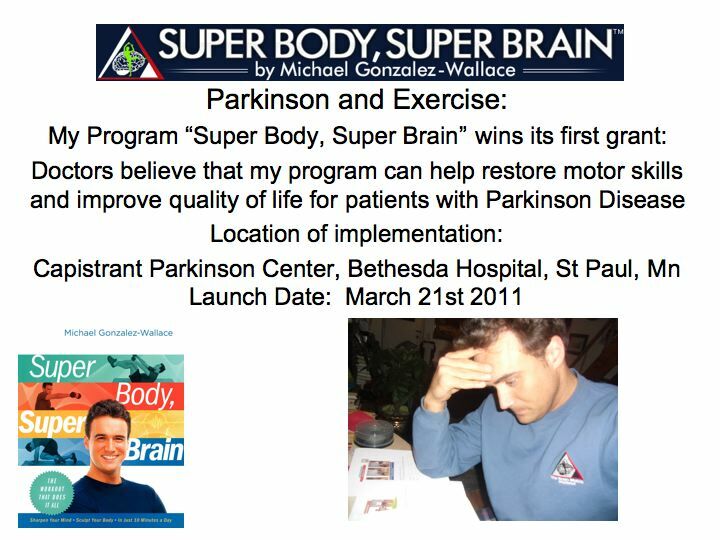 The powerful effects of exercise are normally understimated with Parkinson patients. Since the patient is diagnosed in the early stages it is neccesary to implement a powerful and effective physical exercise program with the goal in mind to improve motor functions, a gradual increase of balance, coordination and range of motion. Previous research, however, has identified certain exercises that stimulate the damaged area. By subjecting patients to workouts based on that data, researchers think it may prevent further degeneration of the substantia nigra, and stimulate dopamine production, says Quincy Almeida, director of WILFRID LAURIER UNIVERSITY ‘s fledgling Movement Disorders Research & Rehabilitation Centre in Waterloo. -Neural Plasticity (changing constantly the program). The program will consist of over 350 exercises structured in 9 progressive levels. -Voice combined with a coordinated movement. Following succesful studies of LSVT/LOUD, where patients improved voice quality and many other important factors such as motor movement, swallowing or limb functioning. I hope to help you with implementing your exercises to my support group. You have friends in peterbrough nh. I will contact you soon. You will make a difference in this area. Exercise gives Nero protection. I will share all I have about my exercie and PD. My pool exercises are wonderful, will send video. Hi Bernadette! yes please contact me at 646 251 4763 i would love to speak to you and see if we can organize something where you live. Looking forward!